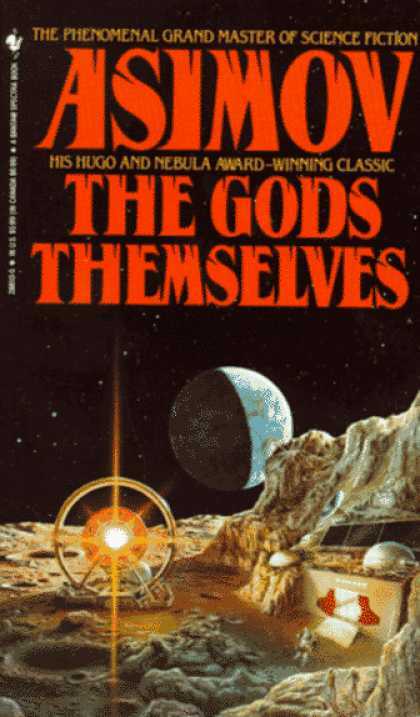 “Against stupidity the Gods themselves contend in vain,” wrote Schiller, and this law of the universe informs the title of Asimov’s Hugo and Nebula winning novel from 1972 which Liquorature chose as its Book of the Session in August 2011. Isaac Asimov, who is perhaps more famous for his robot stories and the Foundation series (which eventually merged with the Empire series to create an impressive overarching historical opus of mankind) was in fact a chemist with a considerable literary output that cut across a wide number of fields – as I’ve noted in my “I, Robot” review, his short instruction book from the fifties, “How to Use a Slide Rule” remains a perennially unread book in my library. Asimov is supposedly one of the three leading authors who helped create and define the Golden Age of science fiction in the nineteen forties and fifties – the other two are considered to be Heinlein and Bradbury, though Van Vogt, Pohl, Clarke and others are also invoked – and he pioneered an engineering mentality in the genre, where unsentimental pragmatists looked at solving problems in the universe in practical ways. It was during this “age” that sci-fi moved away from Buck Rogers and gizmos and more towards people, became more realistic and psychologically nuanced and introduced complex interplay in themes of spirituality and technology. Seen simply, “Gods” is a three act play. A cheap source of energy is found – the inventor, a second-rate scientist called Hallam interprets instructions from a parallel universe – but is discovered, years later, to have deadly impacts for the world. A dissident scientist called Lamont attempts to shut down the Pump but is foiled by a society eager for the clean, inexpensive energy source. In desperation he contacts the parallel universe only to find they have similar problems – their universe will die without the pump. Act two describes the position of the parallel universe and defines the issue starkly, seeming to come to no solution. And Act three does, of course, define a working solution whereby all universes survive and a new equilibrium is created. As with all Asimov’s work, the science is first rate, and while parallel universes have become a bit of a fictional saw – especially for Hollywood – this does not invalidate the theory in any way, and I refer anyone who has issues with this to google the double-slit diffraction grating with a single-photon experiment and its implications. Asimov noted that his inspiration for the story came from a conversation he had with fellow author Robert Silverberg regarding isotopes which could not exist in our universe, and he worked that into the physics of strong and weak nuclear forces, different rules for different universes, to come up with this one. What should be particularly noted is the sheer originality of the aliens in the other universe. I can honestly say that in all the decades I have read science fiction stories with strange beings (dating all the way back to “Gullivers Travels” and yes, I think it is sci-fi) I have never seen these equaled for inventiveness and uniqueness. Star Trek latched on to the humanoid form for all aliens, Star Wars wasn’t far behind, and various other versions were all pale reflections of humanity, but the Soft Ones and Hard Ones are quite a cut above the ordinary by anyone’s gauge. And the science of the solution also has a certain symmetry to it, which gels nicely with all the physics that came before. In an era where cheap energy appears to be coming to a close and aliens are once again seen as aggressive world destroyers who resemble Geiger’s seminal creature from “Alien” rather than the gentle researcher from “E.T.,” it is instructive to see how original and prescient Asimov’s novel actually is. Asimov predicted that energy would become a key issue for future generations (and remember, he wrote even before the 1973 oil embargo which thrust the issue into the headlines) and against that requirement, all considerations would become secondary. This echoed the way that Hallam’s fame and power at inventing the electron pump was more important to him than the repercussions, and how a world’s delight at a cheap, clean and virtually unlimited power source overcame qualms about the long term effects either on themselves or on other beings. This is not to say that “The Gods Themselves” is an easy read or without its flaws. I find, as I almost always have, that Asimov’s characterization is relatively uninteresting, being carried on and informed by the plot rather than any kind of rich and complex internal life (the aliens here are an explicit exception, however). The resolution of the crisis is elegant and symmetrical – three universes, three Soft Ones, three main human protagonists – but I felt that the groundwork had not been established sufficiently to prevent this from skirting the edge of a Deus ex Machina. And, as with so much of Asimov’s work, his delight at describing the physical details detracts somewhat from the emotional highs and lows that might have given this novel more power. And remember, this from an author who wrote the haunting and heartbreaking ”The Ugly Little Boy” about the relationship between a Neanderthal boy and his nanny, the psychologically taut “Nightfall” with its crashing, wondrous conclusion, and the unending striving of a single robot for humanity in “The Bicentennial Man”. Still. I’d recommend this work highly. It has most of what I like in a work of sci-fi letters. An intriguing theme, plausible science, intriguingly rendered and original beings. And, at end, the tongue-in-cheek observation that maybe stupidity doesn’t just extend across our world, but across all universes. The older I get and the more I experience, the more I believe Asimov might have been onto something there.